Our Exercise Science major is designed to help meet the dynamic need of health specialists, specifically in fitness assessment, exercise prescription and program leadership. There is a growing demand in these fields, and you'll be equipped with skills and competencies for careers in exercise physiology, personal training, strength and conditioning, cardiac rehabilitation, lifestyle management, corporate wellness, private health clubs, YMCAs, YWCAs, elderly fitness and exercise programming for special populations. In our new state-of-the-art exercise science lab, you'll the have opportunities to conduct hands-on research with athletes and teams. Our students are designing and implementing tests for topics such as maximal oxygen uptake, metabolic analysis, resting energy expenditure, body composition, and peak power, speed, and agility. Our equipment includes a metabolic cart, treadmills, and cycle ergometers. There are many exciting careers you can pursue with a degree in exercise science including exercise physiologist, strength and conditioning coach, wellness coordinator, personal trainer, and athletic coach. It's also a great foundation for pursuing allied health graduate work for occupational therapy, physical therapy, and athletic training. Below is a sampling of courses offered in exercise science. For more information, see the major requirements. 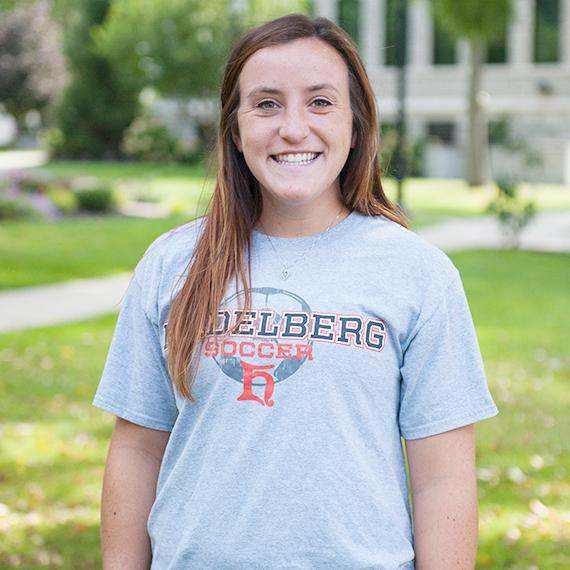 Maddy Hines chose Heidelberg's exercise science program because of the hands-on research opportunities in exercise testing, which she sees as essential for preparing for graduate school. Her career aspiration is to obtain a doctorate degree in occupational therapy. "Heidelberg's curriculum can be individualized, especially with research projects. This will help me transition well to the next level of education."